I took a few photos of Gus without his hat to show-off his nice red hair! Gus is looking for Gertie to rejoin him. This entry was posted in Uncategorized and tagged Gus by mountainmullins. Bookmark the permalink. Welcome Gus, what a handsome lad you are! I know you are going to love living with all the others at Sasha Shangri la. Looks like you and the beautiful Gertie are already fast friends. Your grey duffle coat will come in handy for those cooler days and I am sure will be an added bonus when later in the year out playing with your brothers. 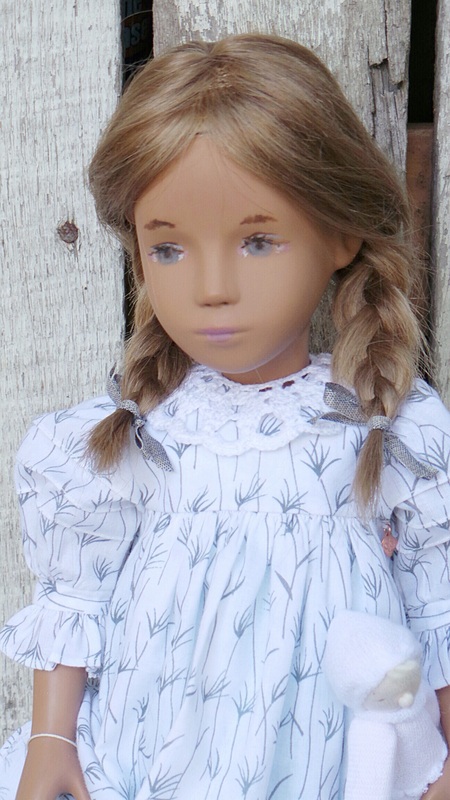 Gertie is looking very fetching in her lovely dress by dolliepatch? 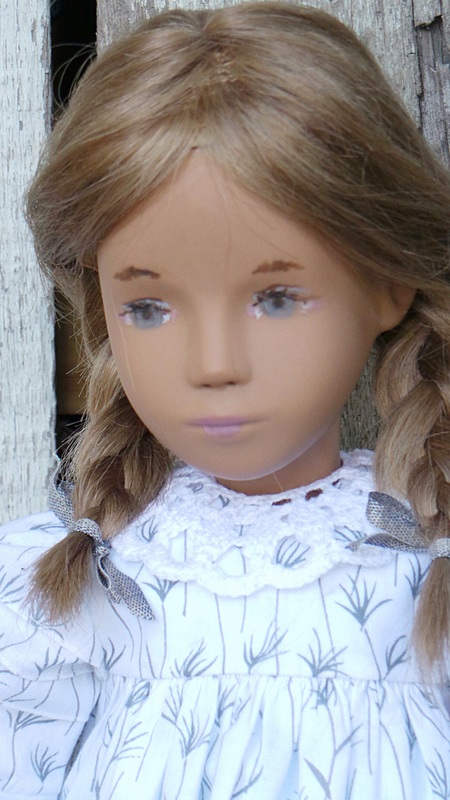 What a great difference Janet’s beautifully hand painted eyes make make to these 80s dolls. Absolutely NO comparison! 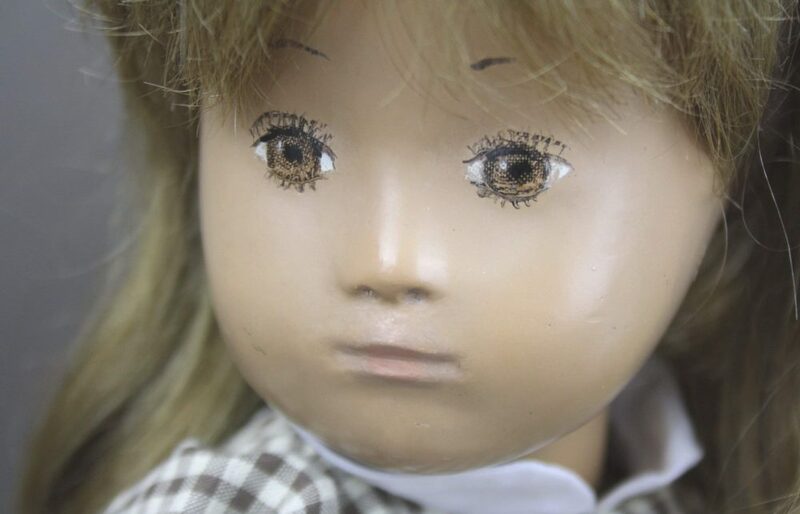 Such a pity that theFrido/Trendon Factory didn’t employ such excellent Sasha Doll (Janet, Shelly, Raven and Sarah Williams to name just a few).’eye-painters’ as we have around now. 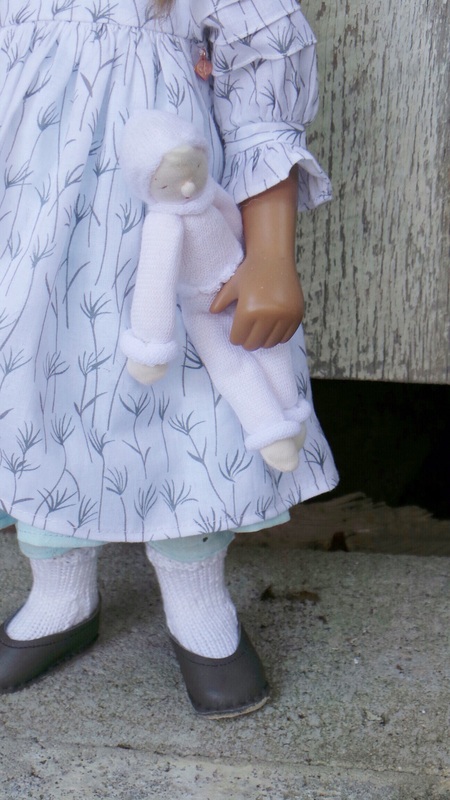 I’m sure that Sasha M herself would have certainly approved rather than have those somewhat expressionless tampa printed eyes that the factory was finally reduced too on account of the high demand for the dolls in the 80s. Angus/Gus is very handsome and striking with his kind eyes and new tailored superb outfit , and that duffle coat’s colour is to die for…..although Gertie has to remain my very, very favourite….can hardly take my eyes off her and have only just realised how well her dress colour matches her stunning eye painting. Many thanks again for another lovely post and the good wishes for the week ahead. You have a lovely Sasha family, Ginger. I especially like Gus and Gertie. Who repainted her? Does she wear a wig? Hello there Janet and thank you for the nice compliments! I am glad you enjoyed the photos of the dear Gus and Gertie that came to life in your artistic hands. :). What a handsome new boy to turn up at the Sasha Shangri-La Ginger! And looks so lovely reunited with his sister Gertie. I love his outfit too, particularly his coat which looks very warm and snuggly, he will certainly get good wear out of it if you have the heavy snow that you had last year. Gertie’s dress is very pretty with the aqua underslip. I like the computer generated watercolours at the end too, I found a similar app for my computer the other day and made one of my town from above, I was really pleased with the effect. Hi Sharon! So nice that you like Gus too! I am very fond of him and Gertie is by his side always! His coat is very wonderful and you are very right, we had very heavy snow fall this past winter and we expect to have it again! So, Gus’s coat will come in very handy a few months from now.